Double-A Semifinals, 3rd/4th Consolations -- Jason Nolf (Kittanning) and Nick Zanetta (Keystone Oaks) will meet in the finals for the fourth straight week, Nolf having won each of the previous three bouts. Both were semifinal winners Friday night. Seth Carr (South Fayette) and George Phillippi (Derry) both won and will meet in the finals. Phillipppi took a 1-0 win in the WPIAL Finals two weeks ago. Dakota DesLauriers (Burrell) will look to take the final step up the awards platform, having finished second last year, third two years back. Garrett Vulcano (Chartiers-Houston) is seeking his first PIAA medal and will face returning champion ryan Solomon (Milton). Nathan Reckner (South Side Area), John Demaske (Jefferson-Morgan) and Jake Temple (Avella) each lost in the semifinals but won consolation bouts and will be in the third-place matches. Phil Marra (Burrell), Dustin Conti (Jefferson-Morgan), Mike Fetchet (South Fayette) each staved off elimination and will also be in third-place bouts. Double-A Quarterfinals -- WPIAL wrestlers won 10 of 21 quarterfinal bouts Friday morning, including Washington County's Garrett Vulcano (Chartiers-Houston) and Jake Temple (Avella) along with John Demaske (Jefferson-Morgan) from Greene County. Kittanning teammates Jason Nolf and Zac Croyle both wom, moving to the semifinals. Other quarterfinal winners include Seth Carr (South Fayette), George Phillippi (Derry), Nathan Reckner (South Side Area), Nick Zanetta (Keystone Oaks) and Dakota DesLauriers (Burrell). Returning PIAA champion Nazar Mironenko (Millfinburg) lost to Nicholas Budd of Port Allegany, 6-2, then was disqualified from his consolation bout. The other six returning champions are all in the semifinals. Double-A 2nd Consolations -- Nine of the WPIAL's 11 quarterfinal losers rebounded to win their initial consolation bouts, clinching medals. Three of the four WPIAL wrestlers who won consolation bouts yesterday also won and will bring home medals from the tournament. Burrell's Steve Edwards and Phil Marra, South Fayette's Mike Fetchet and JJ Walker all won their consolation bouts. Jake Rothka (Bentworth), Nick Gavazzi (Charleroi), Boe Bonzo (Freedom), Dustin Conti (Jeff-Morgan), Austin Griffiths (Southmoreland), Jake Wentzel (South Park), Terrell Fields (Valley) and Cody Jacobs (West Greene) also clinched at least 8th place and can finish as high as third. When the event ends, 22 WPIAL AA wrestlers will medal this year. That's up from 17 last year, but two shy of the 24 total won in 2011. Double-A Opening Rounds -- Chartiers-Houston seniors Tanner Sutton and Garrett Vulcano both won preliminary bouts Thursday at Hershey's Giant Center, advancing to Friday's quarterfinals. South Fayette moved three into the quarters, with wins from Seth Carr, JJ Walker and Mike Fetchet. Jefferson-Morgan had two winners in the first round, John Demaske and Dustin Conti. Other winners from the area include Jake Temple of Avella, Cody Jacobs of West Greene and Nick Gavazzi of Charleroi, who pinned the southeast regional champion. After somewhat of a slow start, the WPIAL AA wrestlers finished strongly, winning 10 of their last 12 bouts, and 21 of 34 total in the preliminaries. Jake Rothka of Bentworth was Washington/Greene's only winner in the first-round consolations. WPIAL wrestlers won just 4 of 13 consolation bouts in this round. South Fayette has three quarterfinalists. Burrell, Chartiers-Houston, Jefferson-Morgan and Kittanning have two each. Ten other schools have one wrestler in the second round. Bentworth, Burrell, South Park and Valley are the schools with consolation wrestlers still alive. All seven returning Double-A state champions Damian Cruz (Bethlehem Catholic), Ryan Diehl (D-3 Trinity), Jason Nolf (Kittanning-2011), Zain Retherford (Benton-2010), Michael Racciato (Pen Argyl), Ryan Solomon (Milton) and Nazar Mironenko (Mifflinburg) won their preliminary bouts, advancing to the quarterfinals. Powerful WPIAL Showing--With 10 individual championships and the team points championship, the WPIAL had one of its best showings ever at the PIAA Southwest Regional. District 7 wrestlers won six titles a year ago. Burrell senior Dakota DesLauriers and Kittanning junior Jason Nolf each won their third straight regional championships. DesLauriers was second as a freshman. Dustin Conti, Jefferson-Morgan, won his second straight title. Allan Beattie's win in the 285-pound final closed the night at the Cambria County War Memorial, giving Burrell Bucs two champions and five PIAA qualifers. The Bucs went 5-for-5 in the medal bouts Saturday night. Chartiers-Houston also claimed two titles when seniors Tanner Sutton and Garrett Vulcano won--the latter by fall, the only pin in the championship matches. South Fayette won the team points championship, outdistancing Burrell 88-83. The Lions' Seth Carr scored one of the more impressive wins in the championships, keeping Justin Patrick (Ligonier Valley) from repeating. South Fayette also has five state qualifers. Avella's Jake Temple won the 220-pound championship, his 100th career victory. Greg Bulsak, a South Park freshman, claimed the 126-pound title with a 4-1 win over John Demaske (Jeff-Morgan). Boe Bonzo (Freedom) snatched an eye-popping ankle pick late to beat Andrew Doak of Blairsville to win the 152-pound championship. WPIAL wrestlers won 8 of 10 fifth-place matches to push the total state qualifers to 34. In addition to five each for Burrell and South Fayette, Jefferson-Morgan and Valley are taking three apiece to Hershey's Giant Center. Chartiers-Houston, Kittanning, Southmoreland, South Park and West Greene have two each, with eight other schools having one representative. After Friday--Burrell moved four wrestlers into the regional semifinals, led by two-time defending champion Dakota DesLauriers. South Fayette, WPIAL team runner-up, has three into the semifinals, six total still active in the tournament. Jefferson-Morgan has two semifinalists, including returning champion Dustin Conti. Washington/Greene Counties have a combined nine wrestlers in the semis and 17 total wrestlers still in the running for the PIAA Championships next weekend in Hershey. Bracket Revision, 113 pounds-- Scratch 5-3 Garrett Foster, Somerset. Move Zach Swarrow (Beth-Center) into quarterfinals by forfeit. Bracket Revision, 120 pounds-- Mike Novak (Mt. Pleasant) has been scratched due to injury. The 120-pound bracket has been revised with WPIAL qualifiers moving up one slot as follows: 7-4 Matt Vickless (Bentworth), 7-5 Evan Myers (Southmoreland), 7-6 Richie McGinnis (Chartiers-Houston), 7-7 Anthony Trimmer (Avonworth). Bracket Revision, 152 pounds-- Luke Slippey (West Branch) has been scratched due to injury. Make 6-3 Cole Confer (Penns Valley). Insert 6-4 Phil Crooks (Marion Center). A dozen different schools sent champions to the top of the awards platform Saturday night at Chartiers Valley High School, led by Burrell's three titlists. Dakota DesLauriers, Phil Marra and Alan Beattie won gold medals, the third for DesLauriers. Kittanning junior Jason Nolf won his third championship as well. A pair of seniors, Nathan Reckner (South Side Area) and Dustin Conti (Jefferson-Morgan) headlined a quartet of repeat champions. Charleroi junior Nick Gavazzi and South Fayette sophomore JJ Walker also won their second WPIAL golds. Team tourney runnerup South Fayette advanced 8 wrestlers to the Southwest AA Regional next weekend in Johnstown. Chartiers-Houston and Mt. Pleasant each have 7 qualifiers. Bentworth, Burrell, Jeff-Morgan and West Greene are sending six with Valley and Yough making reservations at the Cambria County War Memorial for five contestants. Action starts Friday afternoon at 1 pm. Austin McDermitt (Burgettstown) started the night with a 9-1 major decision at 106 pounds, avenging several previous losses to Southmoreland's Austin Griffiths. Phillippi followed with a 1-0 decision over Seth Carr (South Fayette). Reckner, Bulsak and Nolf followed with shutouts. Gavazzi scored the first fall of the finals, pinning freshman Anthony Welsh (Beth-Center) in 3:40. Marra was up next at 145 pounds, keeping Tanner Sutton (Chartiers-Houston) from winning his second championship. Boe Bonzo (Freedom) improved from runnerup to champion with a 6-3 decision over Taylor Jack (Kittanning). Walker claimed a second gold medal, knocking off top-seed Connor Payne (South Side Area). Conti needed overtime, and lots of it, to beat Mike Fetchet (South Fayette). In the first tie-breaker period, Conti picked up a penalty point and a reversal, then held on in the second t-b session to win, 7-6. DesLauriers bested Terrell Fields (Valley) for the second straight year in the finals. Garrett Vulcano (Chartiers-Houston) did what he's done so often for the Bucs, pinning his opponent, this time Zach Walker (South Fayette) in 1:27. Avella junior Jake Temple edged Cody Jacobs (West Greene) before Beattie pinned Southmoreland frosh Jacob Beistel in the third period. There can be no question about the value of experience in Section 1-AA. Eight of the 14 weightclass champions were repeat titlists. Nathan Reckner (SSB) and Tanner Sutton (CH) each won their fourth section championship Saturday night. Shane Gentry (SSB) and Garrett Vulcano (CH) picked up their third gold medals. South Fayette teammates Seth Carr and Mike Fetchet each won their second titles, as did Connor Payne (SSB) and Boe Bonzo (Freedom). Fetchet wrestled a total of 1:56, recording three pins. South Park won three championships--Greg Bulsak, Taylor Wentzel and Rob Wolak. Other champions include Austin McDermitt (Burg), Freddie McKissick (Carl) and Jake Temple (Avella). Temple pinned all three opponents in a total time of 4:13. Section dual meet champion South Fayette has 10 wrestlers moving on to the WPIAL Championships. Chartiers-Houston also has 10 qualifiers. Avella and Burgettstown each have 8, Ellwood City 7 and South Side Beaver 6. Jefferson-Morgan's John Demaske won his third Section title, a 4-0 win in the Section 2-AA finals. The Rockets won four individual titles, including Dustin Conti's second, and the first for both. Ryan Zalar and Bill Bowlen. Conti pinned his way through the 170-pound bracket, needing 4:36 to oust three opponents. Nick Gavazzi (Charl) and Austin Griffiths (Smore) each won their second championships. Southmoreland teammates Dakota Datz and Jacob Beistel won their first titles. Beistel notched three second-period falls to win. Mt. Pleasant picked up three individual championships, Mike Novak, Ethan Charlesworth and Justin Overly. West Greene's Wade Blackmon and Cody Jacobs claimed gold medals along with George Phillippi (Derry). Bentworth is sending nine wrestlers to the WPIAL tournament, including four Section runnersup. Jeff-Morgan, Mt. Pleasant and Yough each have 8 qualifiers, Beth-Center and West Greene have 7, Southmoreland and Derry 6 apiece. Team Tournament champion Burrell is sending a WPIAL-best 13 wrestlers to next week's Individual Championships at Chartiers Valley. The Bucs won five Section 3-AA titles, including the third for Dakota DesLauriers. Steve Edwards and Phil Marra went back-to-back, each winning their second titles. Cory Klems and Alan Beattie also picked up gold medals for Burrell. Kittanning's Jason Nolf won his third title, one of four claimed by the Wildcats. Zac Croyle earned his second while Taylor Jack and Jacob Robb reached the top of the awards stand for the first time. Pat Dewitt (Valley) won his second championship and was joined by Vikings teammates Jihad Ratliff and Josiah Hughes with finals victories. Justo Hernandez (South Allegheny) and Joe Kazalas (Keystone Oaks) won the other titles. Kittanning had six finalists and 11 WPIAL qualifiers. Valley also sent six to the finals and wll take nine to Chartiers Valley. Avonworth and South Allegheny each have seven WPIAL qualifiers, Keystone Oaks has six, Summit Academy five. There are 36 different schools represented in the WPIAL Individual Championships next weekened, including Beaver Falls & California with one each. Two schools--Washington & Shady Side Academy--did not advance any qualifiers. Both had won Team Tournament championships in the five years before Burrell's current run of eight championships in the past 10 years. Winning the final three bouts, Canon-McMIllan rallied from 12 points down to beat Central Dauphin, 34-31, to claim a second straight PIAA Triple-A Team Tournament championhip. Alex Campbell and Angelo Broglia delivered pins at 220 & 285 pounds to tie the dual at 31-31, setting the stage for the final bout. Brendon Price (106) notched a 4-3 win to claim the victory for Canon-McMillan. Dalton Macri added a pin, Conner Schram and Cody Wiercioch picked up technical falls for Canon-McMillan. Alec Hutchin had a decision, helping the Big Macs build an early 14-4 lead. When Central Dauphin had to commit first at 132 pounds, the Big Macs forfeited to Tyson Dippery, keeping the Rams from bumping their lineup to get Colton Peppelman against Wiercioch. While CD won four straight matches to lead 26-14, the Rams could not stop the Big Macs upperweight from piling up bonus points to pull even. The win is Canon-McMillan's second straight against Central Dauphin in the PIAA Team Tourney, snapping the Rams' state-record 95-match winning streak in last year's state semifinals. Canon-McMillan vs. Central Dauphin, the winners of the past five PIAA Triple-A Team Tournament titles, will meet Saturday afternoon for the 2013 championship. The Big Macs beat Easton, 37-35, while the Rams were topping Franklin Regional, 41-25. Canon-McMillan beat Central Dauphin in last year's semifinals, snapping the Rams' state-record 95-match winning streak. Defending PIAA champion Canon-McMillan beat McDowell, 35-27, and WPIAL runnerup Franklin Regional edged Owen J. Roberts, 29-28, in the Triple-A quarterfinals Friday afternoon. WPIAL runnerup Franklin Regional had no trouble with Jersey Shore as the Panthers won their opening-round match 54-15. Defending PIAA champion Canon-McMillan fell behind early, then stormed to a 42-22 win over Spring Grove. In succession, WPIAL AA representatives were eliminated from PIAA title hopes. Chartiers-Houston traveled to Waterford Monday night and was eliminated by Ft. LeBoeuf, 41-21. Thursday, Burrell lost in the first round to Bermudian Springs, 34-29. A couple hours later, South Fayette was dropped to the consolation rounds, losing to West Branch, 33-26. Friday morning, Burrell staved off elimination with a 39-16 win over Western Wayne. South Fayette's stayed ended with a 41-16 setback to Saucon Valley. Burrell 7-straight AA titles, Canon-McMillan 4-in-a-row in AAA. The Burrell Bucs have extended their record Team Tournament championship run to 7 straight years, beating South Fayette, 35-30, Saturday afternoon. Canon-McMillan became the first-ever AAA team to win four consective WPIAL Team Tournament titles, beating Frankllin Regional, 31-26, Saturday night. Last Friday/Saturday during the WPIAL Team Tournament semifinals/finals, we experienced technical issues with our feed/connection to MSA Sports. We understand the frustration that it caused and we are very sorry for the inconvenience. The on-air program was not affected. We have been working with Verizon and MSA Sports to rectify the problem. Please accept our apologies. The Panthers won at Kiski Area, 38-27, taking the Section 1-AAA title. Connellsville, North Allegheny and Canon-McMillan each won section championships in their home gyms. The Falcons outscored Peters Township, 48-17 in Section 2-AAA. The Tigers took care of Hampton, 54-12, to win Section 3-AAA, and the Big Macs claimed a 12th straight section title, beating McGuffey, 61-9, in Section 4-AAA. South Fayette edged Chartiers-Houston, 31-28, to win the Lions' first-ever section team title. Jefferson-Morgan beat Bentworth, 43-22, to win the Section 2-AA crown. Burrell, the six-time defending WPIAL AA team champions, had no trouble beating Kittanning, 49-18, to take the Section 3-AA title. Butler beat Norwin, 34-29, in the finals to win the Chartiers Valley Duals championship. Chartiers-Houston finished third, Hopewell fourth. The Indians edged Waynesburg by five team points, 162.5-157.5, to win the 9th Tri-County Athletic Directors Association Tournament at Ringgold. Blair Academy (NJ), with seven finalists and four individual champions, cruised to the 2012 PowerADE Christmas Wrestling Tournament team title. Canon-McMillan, the defening champion and top-ranked PA team finished third, one point behind runner-up Moeller, OH. Prelims, Quarters, Semifinals, Consolations -- Listen Here! Preliminaries, Quarterfinals, 1st Round Consolations -- Listen Here! Semifinals, 2nd/3rd/4th Round Consos -- Listen Here! Consolation Finals (3rd, 5th, 7th place) -- Listen Here! Championship Finals -- Listen Here! Pigtails, Preliminary Round -- Listen Here! Semifinals, 2nd-4th Consolations -- Listen Here! Consolation Finals -- Listen Here! Quarterfinals, 1st/2nd Consolations -- Listen Here! Semifinals, 3rd/4th Consolations -- Listen Here! Championship/Consolation Finals -- Listen Here! AA Finals (1st, 3rd, 5th, 7th) -- Listen Here! First Round--Bentworth 55, Avonworth 18 -- Listen Here! First Round--Chartiers-Houston 44, Yough 27 -- Listen Here! Quarterfinals--Chartiers-Houston 37, Bentworth 31 -- Listen Here! Semifinals--Burrell 37, Chartiers-Houston 30 -- Listen Here! Third-Place Conso--Chartiers-Houston 42, Jefferson-Morgan 30 -- Listen Here! First Round--Canon-McMillan 56, Ringgold 9 -- Listen Here! First Round--Hampton 44, Peters Township 27 -- Listen Here! Quarterfinals--Canon-McMillan 46, Hampton 28 -- Listen Here! Semifinals--Canon-McMillan 36, Kiski Area 24 -- Listen Here! Championship--Canon-McMillan 31, Franklin Regional 26 -- Listen Here! First Round--Canon-McMillan 42, Spring Grove 22 -- Listen Here! Quarterfinals--Canon-McMillan 35, McDowell 27 -- Listen Here! Semifinals--Canon-McMillan 37, Easton 35 -- Listen Here! Championship--Canon-McMillan 34, Central Dauphin 31 -- Listen Here! Triple-A Semifinals, 3rd/4th Consolations -- Two time defending team champion Canon-McMilan moved four wrestlers to the finals--Dalton Macri, Connor Schram, Solomon Chishko and Cody Wiercioch. Franklin Regional's Michael Kemerer and Tyler Smith, Luke Pletcher (Latrobe), Sam Krivus (Hempfield), Jacob Hart (Hampton) and Matt McCutcheon (Kiski) also won their semifinal bouts. Several championship matches will feature two WPIAL wrestlers: Macri & Krivus (120), Schram & Kemerer (126), Hart & McCutcheon (195). Eight WPIAL semifinal losers won their consolation bouts and will wrestle for third place. Gage Curry (North Hills) and Jesse Rodgers (North Allegheny) have battled through the consolation brackets and will also be in the third-place matches. Seven wrestlers are in the bouts for fifth place, four more in the 7th-place pairings. Triple-A Quarterfinals, 2nd Consolations -- WPIAL Triple-A started with 10 straight wins in the quarterfinals and finished the session with a 23-5 record. Canon-McMillan and Franklin Regional have four semifinalists each. Greensburg Salem, Kiski, Latrboe and Pittsburgh Central Catholic have two apiece. Chartiers Valley, Connellsville, Hampton, Hempfield, North Hills, Norwin and Waynesburg each have one wrestler still chasing gold. Triple-A 2nd Consolations -- District 7 went 8-7 in the second-round consolations, clinching at least 31 medals, up one from last year. North Allegheny had three winners, North Hills two, Belle Vernon, Canon-McMillan and Pine-Richland one each.. Triple-A Opening Rounds -- At one point in the middle of the preliminaries, WPIAL Triple-A wrestlers went 17-1. Overall, District 7 came out of the first round with 28 winners advancing to the quarterfinals. Canon-McMillan and Franklin Regional have four wrestlers into the second round. Seven schools have two each: Greensburg Salem, Hampton, Kiski, Latrobe, North Allegheny, North Hills and Pittsburgh Central Catholic. Six other schools still have one wrestler in the championship half of the brackets. Ten of the 14 WPIAL wrestlers who lost in the preliminaries stayed alive with victories in their first-round consolation bouts. North Hills won both of its consolation bouts. Canon-McMillan lost two of three in this round. Belle Vernon, Gateway, Montour and Mt. Lebanon each got wins from their last competitor in the elimination bracket. The strong showing in the eliminations moves 38 of the original 42 WPIAL wrestlers to Day Two. Three-for-Three in Finals--Canon-McMillan's Connor Schram, Solomon Chishko and Cody Wiercioch each picked up their third straight WPIAL individual wrestling championships, helping the Big Macs to win a third consecutive team points title. Schram and Wiercioch both finished second as freshmen in 2010. Heath Coles (Norwin), Ethan Kenney (Connellsville), Sam Krivus (Hempfield) and Zack Zavatsky (Latrobe) each won their second WPIAL AAA gold medals. Kenney is a four-time PIAA qualifier, finishing third the last two years after winning the WPIAL title as a freshman. Zavatsky is a three-time finalist, finishing second two years ago. The biggest news of the tournament was Jacob Hart's overtime win against defending WPIAL & PIAA champion Matt McCutcheon. Hart's takedown in the Sudden Victory period ended the match. Luke Pletcher (Latrobe), A.C. Headlee (Waynesburg), Josh Maruca (Franklin Regional), Alex DeCiantis (North Allegheny), Zach DeLuca (Pittsburgh Central Catholic) and Shane Kuhn (Kiski) won the other championships. All told, 11 different schools took home gold medals with only Canon-McMillan (3) and Latrobe (2) claiming multiple championships. Canon-McMillan has seven PIAA qualifiers, including two third-place winners. Franklin Regional is sending five, North Hills and North Allegheny four each, Latrobe three. North Hills' total was buoyed with three wins in the third-place bouts. Greensburg Salem, Hampton, Kiski, Norwin and Pittsburgh Central Catholic have two qualifers apiece. Nine other schools have one qualifer each. After Friday--Defending champion Canon-McMillan has nine wrestlers in the semifinals and 11 wrestlers still alive in the tournament. North Allegheny has five in the semis. Franklin Regional, Kiski Area, Central Catholic and North Hills have four each. Franklin Regional, Hampton and Connellsville have 8 wrestlers alive, North Allegheny, Greensburg Salem and Belle Vernon have seven. The top three in each weightclass advance to the PIAA Championships next week in Hershey. After Thursday--WPIAL Team Tournament champion Canon-McMillan advanced 10 of its 12 qualifiers to Friday's quarterfinals. Connellsville has seven, Franklin Regional, North Allegheny and Hampton have six each. Four schools have five still alive in the championship brackets while four more have four in the quarterfinals. With the exception of #3 Sean LaVella (Hempfield--scratch), the top four seeds in each weight class moved into the quarterfinals with wins on Thursday night. In fact, looking at the top seven seeds in the 14 weights, there were only six losses in the opening rounds--two #5's, one #6 and three #7's. Action continues Friday afternoon with the Quarterfinals & 1st-Round Consolations. Tyler Smith (Franklin Regional) and Matt McCutcheon (Kiski) led eight previous section champions back to the top of the awards platform in Section 1-AAA at Gateway. Smith & McCutcheon each won their third championships. Smith was part of a four-bout title run for Franklin Regional, with Michael Kemerer, Josh Maruca and Josh Shields each picking up their second titles. Sam Krivus (Hempfield), Zack Zavatsky (Latrobe) and Shane Kuhn (Kiski) also won their second championships. Other winners include Luke Pletcher (Latrobe), Kyle Berk (Franklin Regional), Tyler Reinhart (Greensburg Salem), Tyler Worthing (Kiski), Drew Phipps (Norwin) and Freddy Mantsch (Hempfield). Six previous champions reached the finals but had to settle for silver--Greensburg teammates Anthony Cable & Zach Voytek, Kiski's Ryan Hardaway & Cole Landowski, Heath Coles (Norwin) and AJ Wilkins (Gateway). 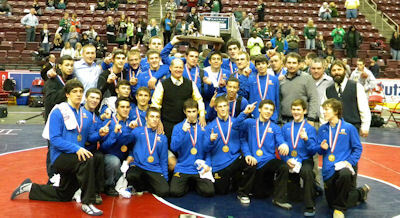 Greensburg Salem is sending a dozen wrestlers to the WPIAL Championships despite winning only one title. Franklin Regional and Latrobe have 10 qualifiers each, Kiski has 9, Norwin & Hempfield send 8 apiece. Seven different schools won championships at the Section 2-AAA tournament Saturday. Connellsville won four titles including Ethan Kenney's fourth individual championship. Tyler Kenney, Dale Provance and Dylan Miller also won for the Falcons. Belle Vernon teammates Nate Russo and Adam Nickelson each won a second title. Derek Verkleeren also won for the Leopards. Devin Fallenstein (Ringgold) and Lukas Etzel (Elizabeth-Forward) won their second gold medals. Paul Dunn and Nate Grygo won for Bethel Park. West Mifflin's James Harrison and James Keys picked up their first championships. Harrison had finished second each of the last two years. Kellan Stout (Mt. Lebanon) also stood atop the awards stand. Peters Township, despite going 0-5 in the finals, has 11 WPIAL qualifiers along with Belle Vernon. Connellsville is sending 9 to Norwin, Upper St. Clair seven and Mt. Lebanon six. North Hills won four championships, including the third individual gold medal for Tyler Walker, at the Section 3-AAA tournament. North Allegheny's Dom Forys and Alex DeCiantis picked up their third titles as did Jacob Hart of Hampton. Gage Curry, Drew Walker and Jonathan Avon also won for North Hills. Jesse Rodgers won for North Allegheny. Central Catholic claimed three titles--Vincenzo Joseph, Chriss Nuss and Zach DeLuca, his second. Pine-Richland mates Brendan Burnham and Pat Kline and Ryan Hannon (Butler) won the other titles. Three previous champions failed in efforts to win another gold medal--Blake Caudill (Butler) and Hampton teammates Kevin Synan and Zach Kocak. Caudil and Synan were both two-time champions. North Allegheny has 11 qualifiers for the WPIAL AAA tournament, Butler & Hampton are sending 10 each while North Hills has eight. Canon-McMillan won the last two points titles at the PIAA Individual Championships. The defense of those titles began in a big way Saturday as the Big Macs won 9 individual championships and will send a dozen wrestlers to the WPIAL AAA Championships. Connor Schram and Cody Wiercioch each won their fourth titles. Solomon Chishko, who missed the entire dual meet season with an elbow injury, won his third championship. Dalton Macri and Alex Campbell defended their titles from a year ago and William Pihiou, champion in 2010, claimed his second gold medal. Canon-McMillan also got championship results from Brendan Price, Sammy Minor and Angelo Broglia. Waynesburg AC Headlee won his second title. McGuffey teammates Brent Blacharczyk and Zac Herrle, Hopewell's Filippo Crivelli and Chartiers Valley's Clayton Sekel won the other championships. In addition to Canon-McMillan's 12 WPIAL AAA Tournament qualifiers, Waynesburg has nine heading to Norwin. Trinity and Hopewell are sending eight each, McGuffey and Chartiers Valley seven apiece.